Switzerland 2002. 35mm, color, 1:1.66 Dolby SR + 16mm, color, comopt, colour, 124 min. Following "Alpine Ballade" and "The Peasants' War", "Shepherds' Journey into the Third Millennium" is the third film of a trilogy in which I deal with the fundamental issues of human beings and their existence. The main themes are the issues of identity, survival, and future. One of the oldest cultural forms of human existence is that of the shepherd. In its essence it is of economic interest even today, and also embodies a distinct lifestyle and world-view. I wanted to get to know the life of today's shepherds on the threshold of the third millennium. In a time of upheaval and changes in values between tradition and future, the film is also an expression of my own inner conflict. Versions Untertitelversionen: d/f, d/e, d/i, e/sp. LOCARNO (CH): 55. Festival Internazionale del film Locarno 1.-11.8.02 "Appellation suisses"
MEXICO: Cineteca Nacional, Mexico City ein historisches Schweizer Filmprogramm. 8. – 20. Dezember 2015. Preis der Gemeinden im Wasseramt 2003 – Text der Begründung. 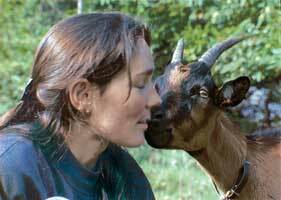 One of the most beautiful films about tradition, identity and contemporary lofe in Europe in the 21st century is the Swiss film "Shepherds' Journey into the Third Millennium". At the dawn of the new millennium, the shepherds move through a world that is strictly civilized. But this has not destroyed theit dreams, which are still fertilized by the myths of a reconciliation between nature, the animal and man. Capturing the weather-beaten faces of these hardworking men and women in close-up, and capturing in the same movement the metaphysical splendour of the landscapes, the director takes us on a quite singular migration to summer pastures. At the dawn on the third millennium, Erich Langjahr followed the shepherds of the Swiss Alps, from the dephts of the vallys to the highest mountain pastures, from encampments in the open air to fireplaces in mountain cabins, from January to December, in snow or sweltering sunshine. Can a donkey's patient gaze stir a sense of wonder? Erich Langiahr's lovingly crafted film on Swiss itinerant shepherds in the snow-covered Alps proves that it can. Slow down, pay attention, and let Langiahr's film work its magic. Taken separately, many images in Erich Langjahr's film about Swiss itinerant shepherds seem commonplace-a man building a Fire, a couple with their newborn son, a black-faced sheep bejeweled with crusted snow, children playing while their father splits wood nearby. Langjahr, however, masterfully uses ambient sound, evocative music, an editing rhythm that captures his subjects' pace of life and keenly observant camerawork to deepen the importance of these images. Often, they gain so much meaning from their place in the film that they stir, surprisingly, a sense of wonder. Langjahr works this magic by inviting us to slow down and pay attention. Thomas tends sheep during the winter around Lake Lucerne, joining his wife and their three children on their farm the rest of the year. Months of bone-tiring vigilance, fingers blistered by milking goats and days away from his family sweep away any romantic notions one may have of Thomas's life in this idyllic place. In the summer, Michel and his partner, Bea, tend the same sheep in the magnificent world of the high snow-covered Alps. Michel and Bea, without children, enjoy a life of greater freedom than Thomas, living Outside in the natural world. Langjahr's film shows us a way of life that has a wholeness increasingly rare in our hurried, harried world. This is a beautiful film, with lots of great footage of shepherds. The rolling hills, the bitter cold of a winter day, the coolness of water as children bathe, the hours of toiling, and the warmth of family are all captured perfectly. The serenity of the mountain landscapes pair perfectly with the sparse dialogue. We meet several shepherds, all living in idyllic mountain dwellings. What the film lacks is staying power; we see several different stories that are almost virtually the same, and one can only watch shepherding for so long. We don't get fascinating subjects that really make an impression or strike us in any way. For Swiss filmmaker Erich Langjahr, tending sheep is not just a job; it's a way of life that deals with fundamental issues of human existence, identity, and survival. Following two itinerant shepherds over the course of several years, Schepherds' Journey meticulously documents and reflects on a vanishing way of life that is in tune with the four seasons and full of mystical moments, yet also marked by extreme loneliness, privation, and worries. Why would these young men, who were not born into a shepherds' family, choose to forgo many of the conveniences of modern society and live a life that keeps them away from their loved ones for months on end? One of Langjahr's biggest accomplishments in this mesmerizing film is having his subjects share graciously and freely enough of their innermost feelings and thoughts to help us understand what motivates them to lead a simple life. Beautifully photographed, leisurely paced, and set to an original score, Shepherds' Journey paints in lush detail a moving tableau of the fragile unity between humankind and nature that resonates with viewers everywhere. In the age of jet travel, you have to have the courage of your convictions to turn heads with a story about shepherds. Erich Langjahr urges us to slow down. Reminds us, without scolding, to look around us. Calls, without raising his voice, to our heart and soul. This documentary film-maker was awarded the 'Kulturpreis der Innerschweiz' on 21 September in Lucerne. We need moments when time stands still. They take us back to our roots. They take us away from hectic and stress, and heal our souls. You can follow Langjahr's shepherds' journey in your mind. Or you can even put on your hiking boots and rucksack and set out along the paths yourself. All you need is time. Peace. Far-sightedness. And calm. Thomas Landis, one of the shepherds, has itchy feet nevertheless. It's all part of the job. "I want to be out there travelling, somewhere in the world." Every morning he packs up his things, ready to pitch his tent somewhere new every evening. He spends his days wandering through the countryside around Lucerne with his sheep. His life may look modest, but it is rich in reality. No appointments. No stress. Just walking. Waiting. Watching. Smoking. Counting. Resting. The meditative images in this film, the way the producer captures the shepherds' knack of observing details, of pausing to reflect on life, transform this tale into an experience that leaves a deep and lasting impression. But not all is meditation: there are lambs and kids to be brought into the world, cheeses to be made, fire to be kindled, hooves to be cut and the constant need for vigilance to ensure the herd remains together. Langjahr is a master of his craft. He has traveled all over, filming documentaries, for around thirty years. Following his "Alpine Ballad" and "The Peasants' War", "Shepherds' Journey into the Third Millennium" is the third film of a trilogy. Langjahr says himself: "I deal with the fundamental issues of human beings and their existence. 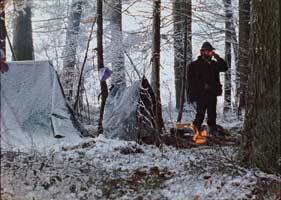 The main themes are about identity, survival and the future." 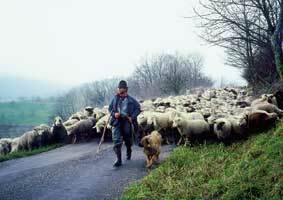 The shepherd's life is one of the oldest cultural forms of human existence. Even today, it embodies not only economic interest, but also a distinct lifestyle and world-view. "I wanted to get to know the life of today's shepherds on the threshold of the third millennium. In a time of upheaval and changes in values between tradition and future, the film is also an expression of my own inner conflict." Langjahr tells a modern shepherds' story based on transhumance, that transfer of herds between the seasons in search of greener pastures. Thomas and Susanna Landis-Giacometti and their children, and Michel Cadenazzi and Bea Amman too, take on a life of privation and face a challenge that often reaches the limits of their capacities. Erich Langjahr: "They do not come from an agricultural background, but have chosen this life themselves out of a need for the freedom to do something meaningful." The almost biblical images are breathtaking, and the privations imprint themselves deeply on the spectator. But Langjahr's shepherds' journey is not just a hymn of praise to a romantically idyllic shepherd's world. This is a film about survival. As Heidegger once wrote so beautifully: "Everything speaks the renunciation unto the Same. The renunciation does not take. The renunciation gives. It gives the inexhaustible power of the Simple. The message makes us feel at home in a long Origin." Much more intersting than the feature films were documentaries. Focusing on typical Swiss themes, many of them gain intensity and offer a fascinating insight into customs and ways of life, which are unknow outside Switzerland. Erich Langjahr, for instance, pictorializes the life of two shepherds in "Hirtenreise ins dritte Jahrtausend". The director abstains from commentary, delegating the narration to acute observation of the daily routine of life. There is nothing didactic in this documentary. With its wonderful, meditative rhythm. "Hirtenreise ins dritte Jahrtausend" is not only a description of a lifestyle in action, which its slowness contrasts sharply to the modern world, but also a new approach to perception.